The crosscutting concepts are probably the hardest of the three dimensions to incorporate, because they are the least tangible element of the three strands of science instruction. That said, you probably have been using them forever anyway, you probably do it naturally, and you might be surprised how easy it is to actually start incorporating these. 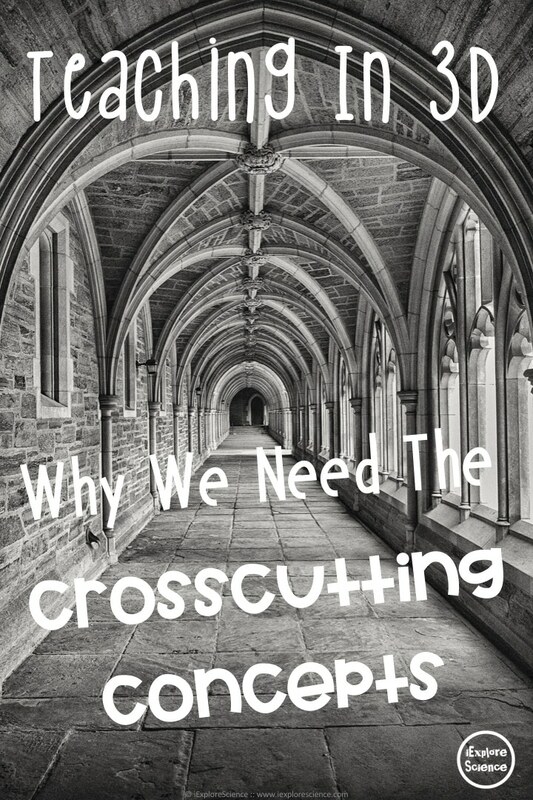 What Are The Crosscutting Concepts? According to the NSTA, the Crosscutting Concepts “have application across all domains of science. As such, they are a way of linking the different domains of science.” They are based (like everything in the standards) on A Framework for K-12 Science Education: Practices, Crosscutting Concepts, and Core Ideas (Framework). The Framework identified these seven big concepts for their ability to cross disciplinary boundaries and help students deepen their understanding of the core ideas within the disciplines. These concepts also contribute to the development of a “scientific worldview” — or a way to view and understand the world that is based on scientific principles and approaches. These concepts are not new — we have long viewed them as themes or underlying ideas. The difference between these and the Crosscutting Concepts included in the Next Generation Science Standards is only that the NGSS expects we incorporate these ideas into our instruction explicitly. We cannot expect students to develop understanding of these ideas without providing them the support and learning opportunities to do so. 1. They provide the mental tools – or schema – necessary for students to make sense of new information. In psychology, schemas are frameworks that help us organize, understand, and process new information. We all interpret new information in light of what we already know. We process information based on what we have thought and believed and experienced in the past. The crosscutting concepts provide this type of framework that can help students acquire new information by offering a framework through which to understand and connect it. They provide an access point or approach to the new information to take it from something overwhelming and complex to digestible pieces that make sense. 2. They support students’ use of science and engineering practices. You probably noticed in the above examples that the crosscutting concepts (patterns, systems and system models) were paired with science practices (planning and carrying out investigations, developing and using models). Different crosscutting concepts tend to pair with different science and engineering practices and support students’ performance. 3. They improve the transfer of knowledge from science fields to engineering. Because exposure to engineering has historically been limited, especially so for students in at risk populations, the field can seem for many foreign and intimidating. The crosscutting concepts can provide a bridge for students to discuss engineering problems and solutions using vocabulary that is already familiar to them. All too often for at-risk students, science education is “dumbed down.” Instead of providing the rigorous, hands-on learning experiences that are actually valuable in developing science understanding, science class becomes a 45 minute venture into vocabulary definitions and craft projects. Crosscutting concepts can add rigor to these types of courses, supporting deeper thinking and understanding by shifting the focus from surface-level knowledge to the big picture connections. Your students aren’t engaged. They aren’t thinking. They don’t care. And you’re just tired of teaching with notes and lectures and texts. Sound familiar? It’s time to try something new. You can learn more about transforming your instruction as you learn to teach with the NGSS at the Science Teacher Tribe. As a Science Teacher Tribe member, you get access to a professional development community full of resources designed to help you make the transition simply and smoothly. I’m not going to lie – it definitely takes some work, but it doesn’t have to be confusing or overwhelming or a struggle. It’s about adopting a new mindset, and our workshops and resources are designed to support you through it. Learn more here, and check with your district about obtaining funding.